This school year, I was lucky enough to attend a professional development training on science and engineering in kindergarten through second grade. It’s an area that I had little to no experience in. At that time, I had never seen what it would even look like in a primary classroom. S.T.E.M. has been an area I’ve hesitated to delve into without guidance because I’m simply unfamiliar with it. But, I walked out of this three-day workshop feeling really excited and thankful for what I learned. 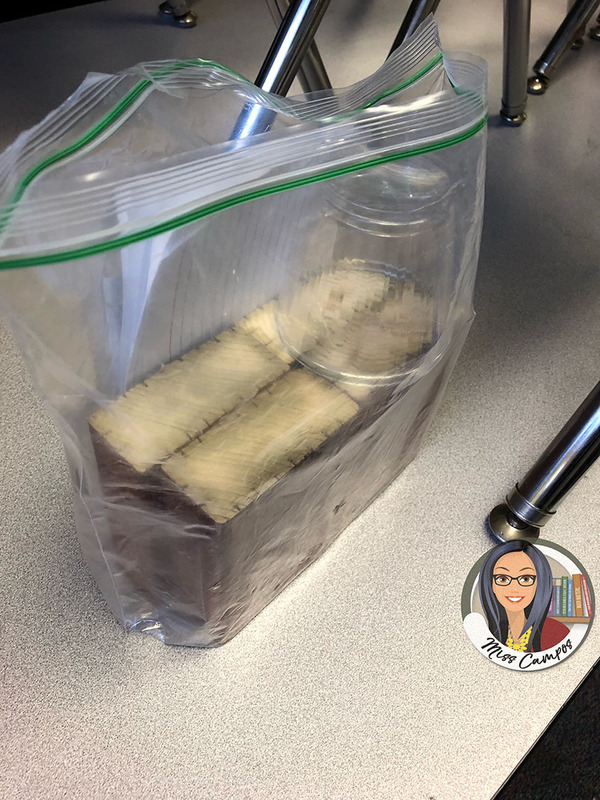 Unfortunately, like many Kindergarten teachers will notice, K-2 workshops almost always have several lesson ideas that are way too hard for Kindergarten. So I could not use all of the lesson ideas I learned because they required skills like cutting and measuring a fixed amount of twine, tying twine, using a fixed amount of tape, and drawing a design in groups of 5 or more. I felt that Kindergarteners would struggle with these areas due to their lack of maturity and fine motor skills. Nevertheless, there were still many great ideas that were applicable to what my class of 5 and 6 year olds can do. Above all else, the workshops made me motivated to learn more about what engineering looks like in Kindergarten. I hope my description of what I learned will help you get started with engineering lessons in Kindergarten too. One of my biggest takeaways from the workshop was appreciating the story that the speaker read to us in order to set up the first engineering challenge. 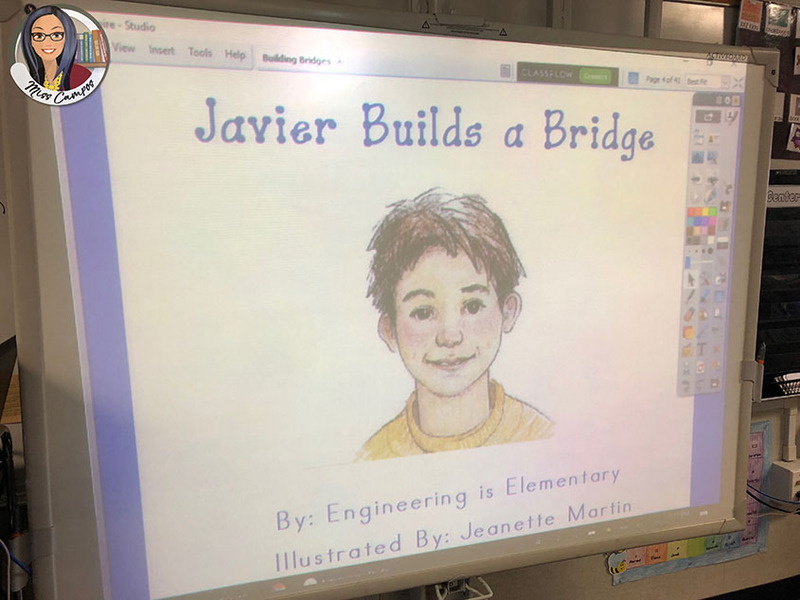 It was called Javier Builds a Bridge by Engineering is Elementary. In the story, the little boy’s younger sister couldn’t cross a rickety bridge when she wants to follow him to play in his tree house. 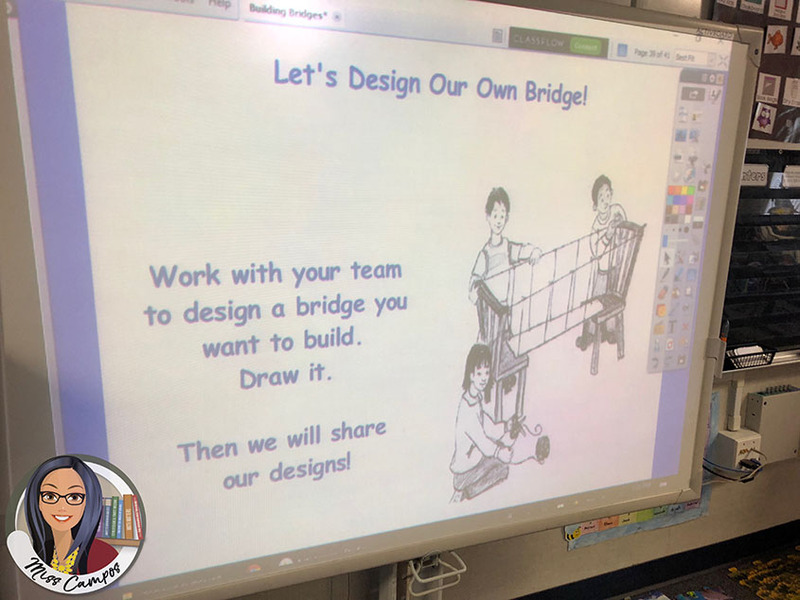 So the class is asked to design a strong bridge so Javier’s little sister can cross it safely. I really liked the notion that Kindergarten engineering challenges start with a read aloud. So I went out and searched for children’s books on bridges, architecture, science and engineering and bought as many as I could. 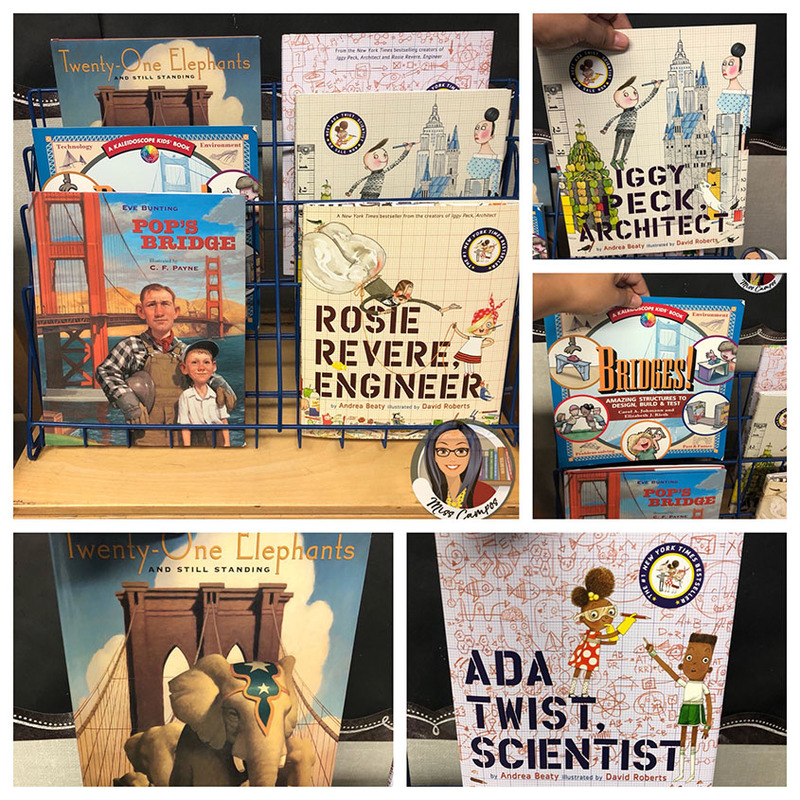 Here are the titles I was able to find: Pop’s Bridge, Bridges, Twenty-One Elephants, Iggy Peck Architect, Ada Twist Scientist, and Rosie Revere Engineer. I have only read one book to the class so far but my goal is to read each one and come up with multiple mini-science & engineering activities for each read aloud so I can build up my collection of lessons. Once I do, I will be posting the lessons on this blog so be sure to check back regularly. To begin, I used a flip chart edited by my colleague who also attended the sessions. 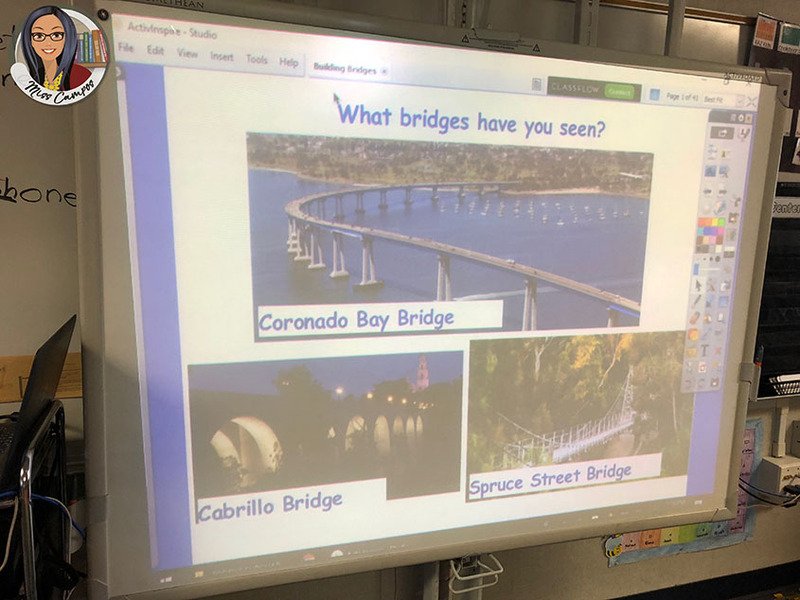 It had pictures of local bridges, the main story about Javier, facts about bridges and a challenge to build three bridge types. 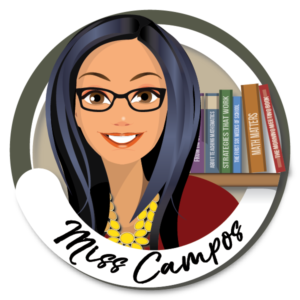 Since you won’t have access to those resources from the company, I created freebie for you to download that can get you started in a similar but much simpler way. 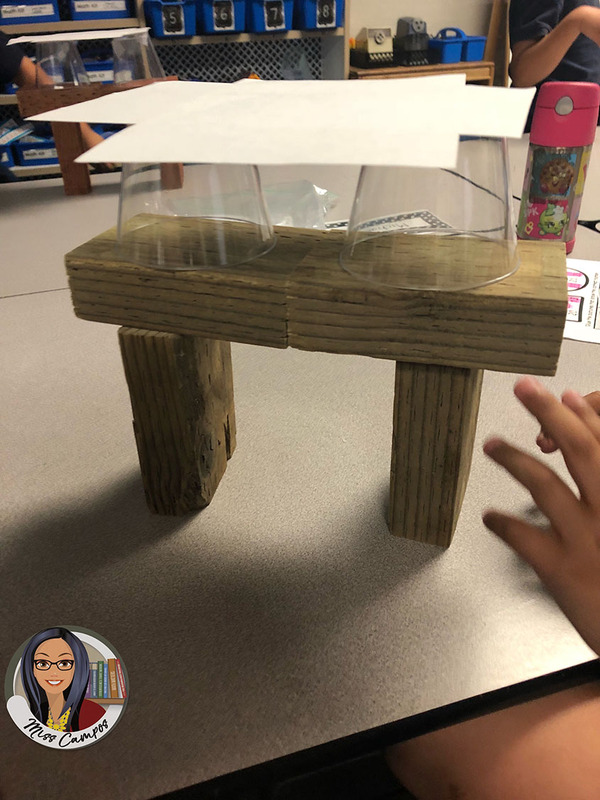 If you’d like those masters click on this title, “Beginning an Engineering Challenge in Kindergarten” to download it. It also contains a river image that I’ll explain below. The supply bags that each pair of kids were given for this challenge was gallon size. It had four wooden blocks, 6 large index cards and two clear plastic cups inside. I have 24 students so I had 12 bags prepped. 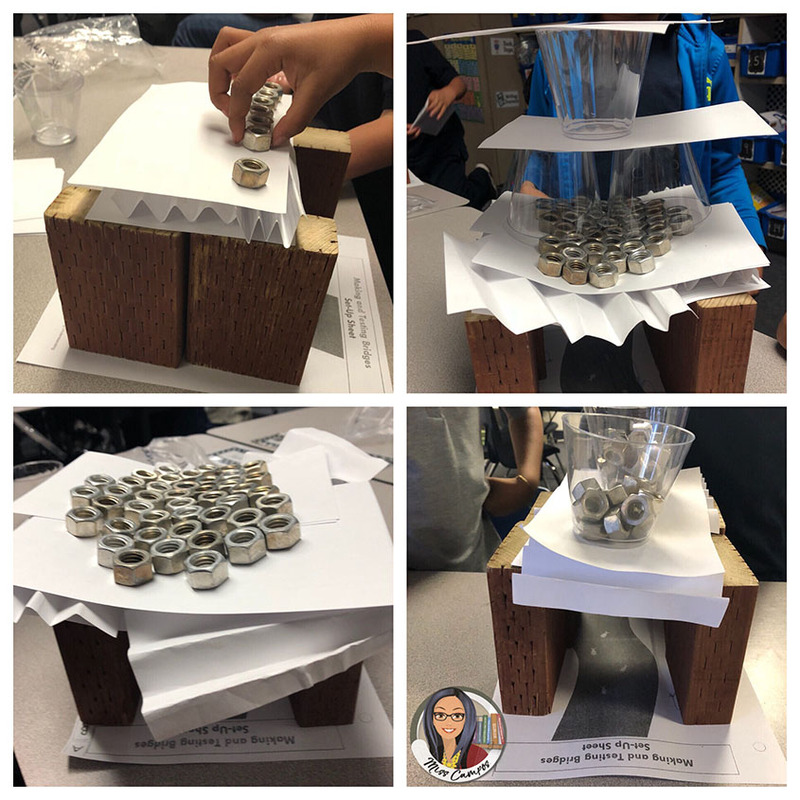 The kids were asked to work with a partner to build a bridge that would hold the weight of one or both of the cups. 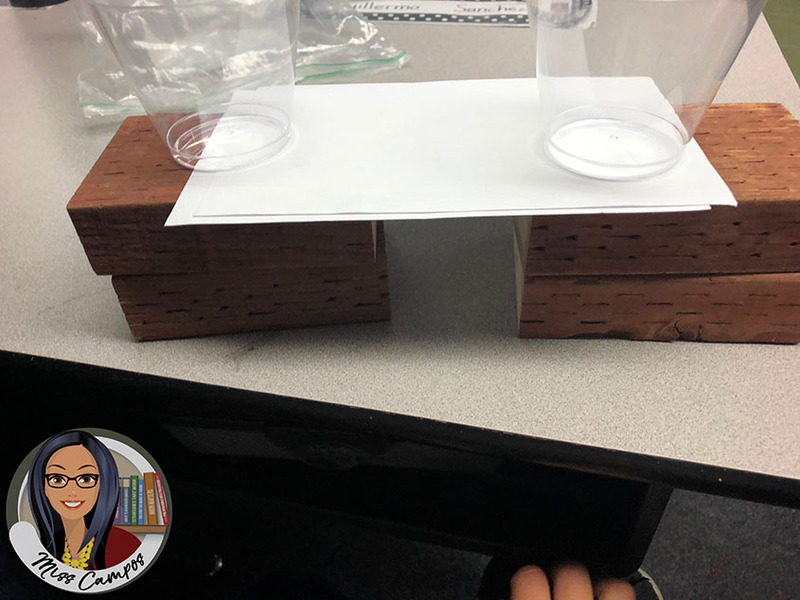 If they wished to use their cups as part of the design, I told them they could take extra cups from my supply basket to use to test the bridge strength. After each set of partners had finished their bridges, I rang the bell and had the kids come back to the class rug. Once there, I told them that they were going to now to make their bridge go over a river. I passed out a page from the workshop’s program with a river graphic on it. I provided two different river graphics for you in the download link above. I told the pairs that they must rebuild their bridge to make sure no part of it was in the water. 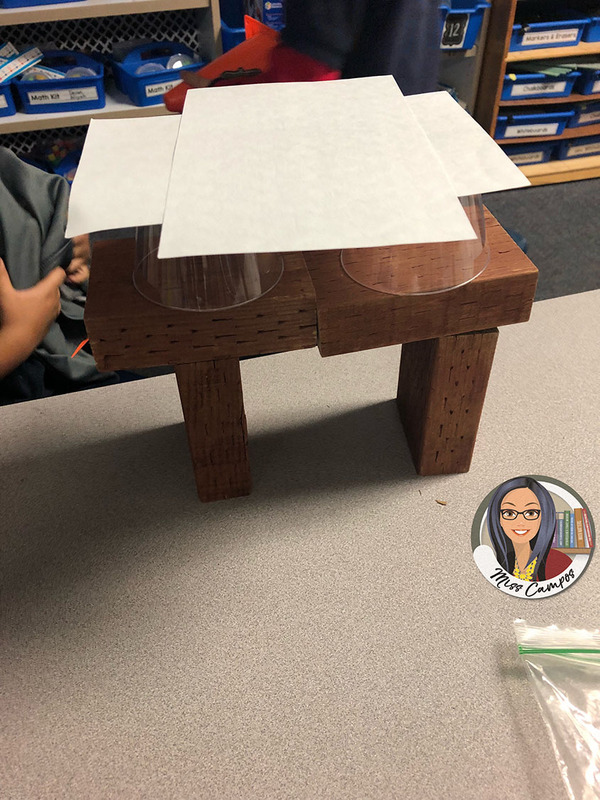 This forced them to make the beams further apart so they could see how weight distribution changes with beams further apart. After that fun challenge, I rang the bell again and called the kids back to the rug. 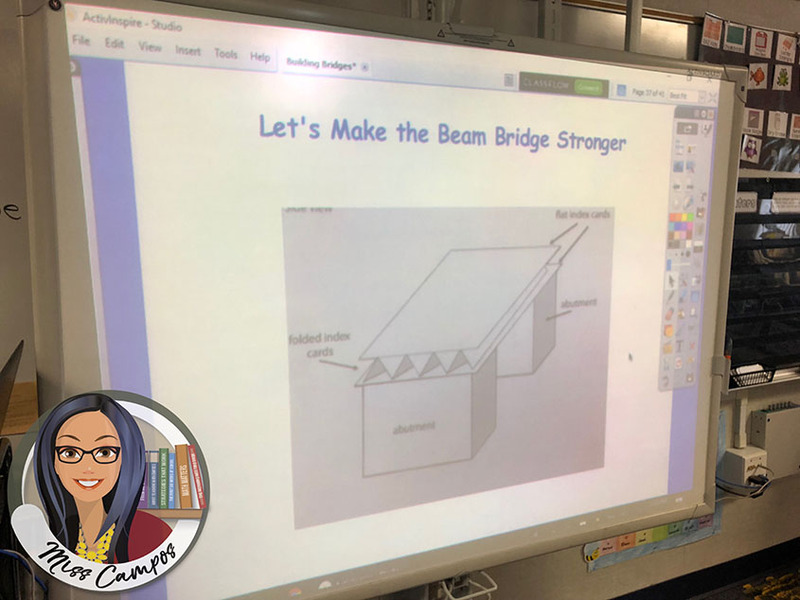 Once there, I showed them the slides that had to do with making a beam bridge stronger. It involved creating a bit of a sandwich effect with the index cards. The filling of the “sandwich” required kids to fold the large index card like a fan. 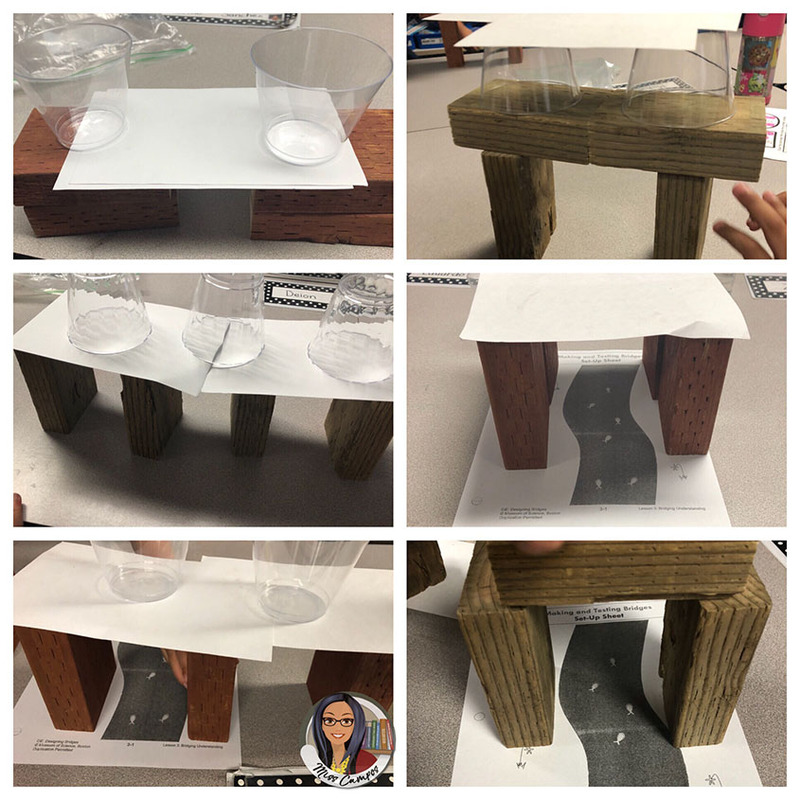 I learned these are all real life ways of making bridges stronger! A lot of kids had trouble folding the index cards so I had to go around and assist the 12 pairs of kids in small ways until the cards were folded just right. I had a spare stack of large index cards on a table to replenish the ones the kids didn’t fold right and were unusable. As an extra part of this challenge, I passed out 12 bags (to the 12 pairs) of heavy nuts and told them their newly strengthened bridge must be able to hold up as many nuts as possible. This was definitely the most fun part of the day’s lessons for the kids! They were so amazed to see just how many nuts their bridges could hold. 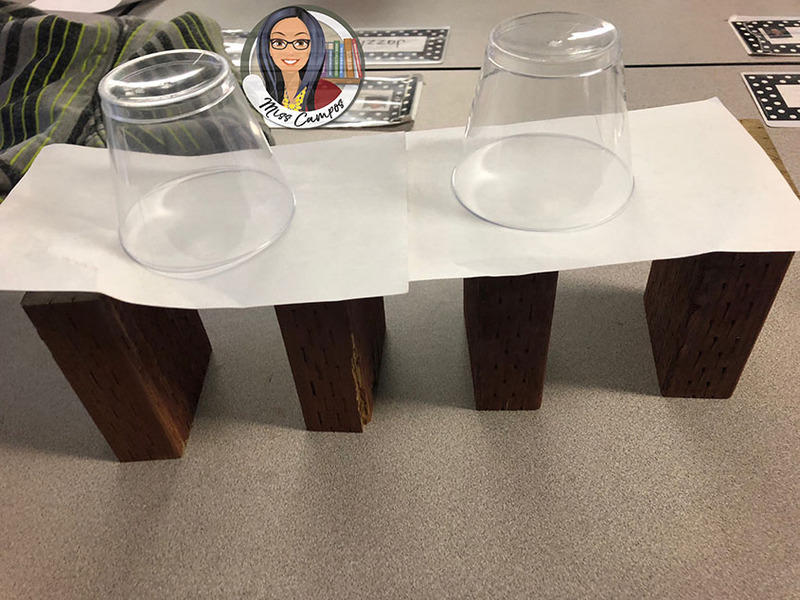 We definitely had to stop after a while and do a carousel walk around the room so kids could quiet down ad most importantly so they could see all their classmates creations and just how many nuts some of these bridges could hold. After the carousel walk, I gathered the class on the rug again so they could calm down. They were so chatty and excited. It was very rewarding to see them so happy with their bridges. So we talked about the last few slides on our flipchart and discussed the vocabulary words: push and pull. We drew arrows on the points we thought were responsible for pushing and pulling on a structure. We talked about gravity. 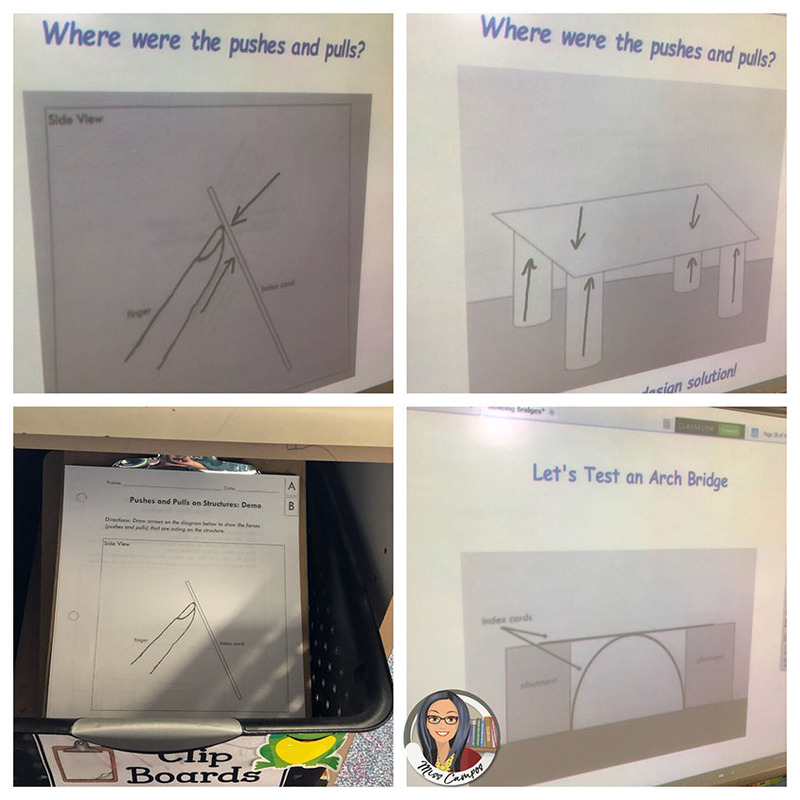 We talked about when they’re building their bridge and they feel a part is falling that’s a push force working on their bridge. So they need to counteract it with a pull force in the other directions to make that part of the bridge stable again. 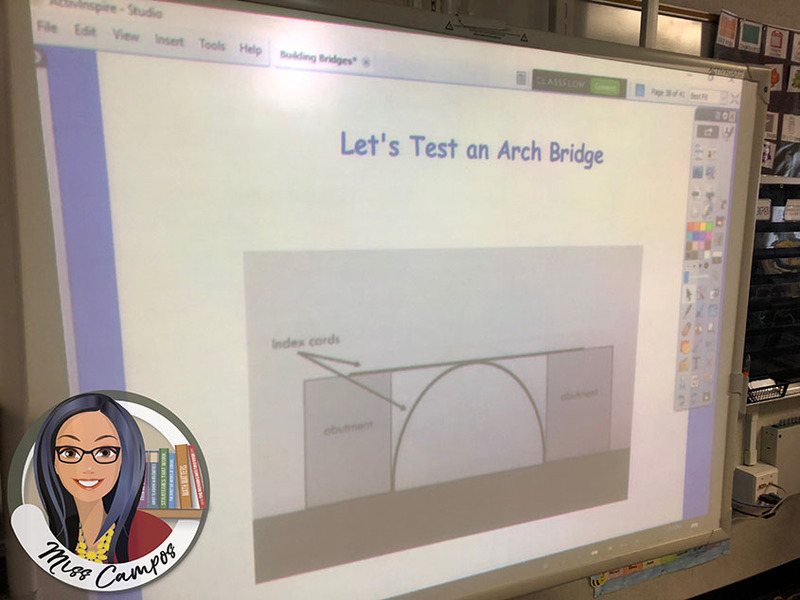 Last, we talked about arch bridges and how the next time we do an engineering challenge, we will be making arch bridges and suspension bridges. We cleaned up the STEM bags and I disposed of the folded or wrinkled cards and replenished each of the 12 bags with 6 unused large index cards. If any of the cups cracked, I replenished the bags with new cups too. I also have 12 plastic cars that I have not brought out yet. They are the wind up kind so I am going to challenge the kids to make a longer bridge using more blocks and ask them to use the cars on it. To date, we have not yet finished the last two bridge types: arch and suspension. But we have it marked on the class’ calendar and the kids are so excited and counting the days. I will post about it on my instagram and facebook page so be sure to check them out to see the pictures of the second half of this lesson.